Most of us like to achieve high performance consistently and at any time. However, often we can be highly effective at one time, and other times we’re very unproductive. Research shows that there are five attributes that either positively or negatively impact our performance variation for a task or a challenge. Abilities: what are the skills and resources I need? Can I apply my strengths and work around my weaknesses to get this done? Approach: what is my approach to this challenge? What is my motivation, passion or interest? Reward: what do I get out of this? What’s in if for me in the short or long term? Colleagues: how do I need to interact with those around me in this specific case? State of mind: what am I thinking? Am I positive and confident that I rise to the challenge? Although it has been estimated that the state of mind accounts for at least 50% of the variation in an individuals performance, on average we only spend 5% of our time on optimizing our performance due to mental training. S&OP is a never ending recurring business planning process that often operates in a VUCA (Volatile, Uncertain, Complex and Ambiguous) world and is impacted by continuous internal or external threats and challenges. For S&OP to run effectively, you need to be clear, focused and committed to what you’re trying to achieve. You need to have the right state of mind, rise to any challenge regardless the circumstances of the day, and perform to your best. Together with Supply Chain Media, I developed a 10-question checklist to assess the mindset of an organisation. Based on the checklist we developed a survey to assess the S&OP mindset across companies. We had 52 responses across our S&OP mindset survey. We asked participants to self judge their S&OP effectiveness and share the key differences between self proclaimed effective and ineffective S&OP processes. 62% of survey participants with self proclaimed effective S&OP processes answered yes to the question ‘Do you think effective mindset and behaviours are addressed enough in your organisation?’. Versus 25% for ineffective S&OP. This indicates that organisations with effective S&OP processes are more likely to develop and train their employees in effective mindset and behaviours and therefore address the employee state of mind that impacts over 50% of performance variation. 62% of survey participants with self proclaimed effective S&OP processes answered yes to the question ‘We have a relentless focus on only what is important for long term business objectives’. Versus 19% for ineffective S&OP. Ineffective S&OP processes seem to have a significant lack of focus on one of the main objectives of S&OP; long term business planning. 77% of survey participants with self proclaimed effective S&OP processes answered yes to the question ‘S&OP stakeholders are time-wise committed to this process, planning rules and agreed priorities.’ Versus 44% for ineffective S&OP. It seems stakeholders in effective S&OP processes are simply more committed. 92% of survey participants with self proclaimed effective S&OP processes answered yes to the question; ‘Team members openly challenge each other and put critical topics on the table.’ Versus 50% for ineffective S&OP. Open challenge and discussion of critical topics is a sign of a psychological safe and trusted group environment, where people don’t feel theathened to speak up. This environment, which ineffective S&OP is less likely to have, improves the decision-making process, team effectiveness and employee well-being. 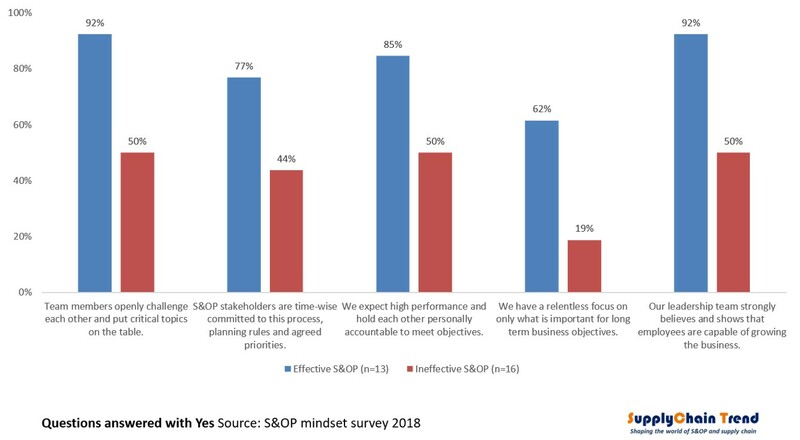 85% of survey participants with self proclaimed effective S&OP processes answered yes to the question; ‘We expect high performance and hold each other personally accountable to meet objectives.’ Versus 50% for ineffective S&OP. The effective S&OP processes expect high performance, but also have the trust and relationships to hold each other personally accountable, rather than avoiding accountability conversations. 92% of survey participants with self proclaimed effective S&OP processes answered yes to the question; ‘Our leadership team strongly believes and shows that employees are capable of growing the business.’ Versus 50% for ineffective S&OP. Leaders who show their employees can grow the business, empower their employees with tasks and projects to do so. Empowerment creates trust in the leadership team and is a significant employee engagement driver. The state of mind is an important driver for consistent individual performance. The results of our survey indicate that the state of mind in S&OP is likely an important driver for S&OP effectiveness. We’ve also indicated that the S&OP mindset impacts individual employee performance, engagement and well-being. We can safely say that the S&OP mindset is either a consequence of the wider company culture, or it is influencing the business culture itself. Developing an S&OP mindset will therefore not only improve S&OP effectiveness, it can also influence company culture for the better, with additional positive effects on employee performance, engagement and well-being. These are important reasons to address the S&OP mindset. You can download the full S&OP mindset report here.